Great Iraqi and middle Eastern food with sensible prices. You will get free soup, tea and sweet, Baklawa. 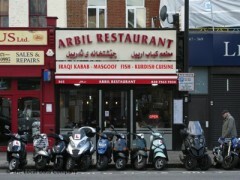 Compared with other similar resturants in Edgeware Road, i greatly recommend this returant. Wonderful restaurant. Great variety of Kurdistani and Middle Eastern Dishes. Its name Arbil refers to the Cpital city of Kurdistan Region.